Note: This isn’t a tutorial about using TinyMCE for all rich text editing in SharePoint; it shows you how to use it on a per-form basis. It’s theme-able, so I can make it blend in with any branding that I use. It’s fast; it only loads the plugins you tell it to load, so it can be as lightweight as you want. WordPress uses it, so any lessons I learn customizing TinyMCE in SharePoint can be applied to creating TinyMCE plugins for WordPress, and vice versa. Before TinyMCE can be used, you need to host the scripts, CSS, and images that it uses. I typically store these in a document library at the top level of the site collection, but you can put them in any location that your users have read access to. Download and unzip TinyMCE from the website (http://tinymce.moxiecode.com/download/download.php – for this tutorial you should use the jQuery version, not the standard or development version). Once the files are unzipped, upload them to a document library or your location of choice. We’ll also be using jQuery for some DOM manipulation on the form to prep it for TinyMCE, so be sure to upload that as well if you don’t already use it in SharePoint. Now we need a list with a “Multiple lines of text” column on it. You probably already have a list in mind to use this on (if not, create one), so make sure the column is set to “Enhanced rich text” instead of “Plain text” or “Rich text.” If you set it to “Plain text,” SharePoint will escape the markup in the column and your users will see a bunch of HTML tags instead of nicely formatting content. Setting it to “Rich text” could probably work, but we don’t want SharePoint removing links or other markup if someone happens to edit an existing item using the default RTE in the future. Set the column to Enhanced rich text. Now we can start adding our scripts to the form pages. You generally shouldn’t modify the default NewForm.aspx and EditForm.aspx pages for a list, so open your list in SharePoint Designer and make copies of both pages. I like to rename the copies “NewFormCustom.aspx” and “EditFormCustom.aspx” respectively. I chose these options because they provide everything I wanted for the content that will be used on my list. This is not a recommended configuration for everyone; it is simply what worked best for me on a particular list. TinyMCE comes with a few different skins, and more can be added (or you can make your own). Because I’m using MOSS 2007, the Office 2007 theme seemed appropriate to use. This is a list of all of the TinyMCE plugins that I want to load. Each plugin adds some additional functionality to TinyMCE such as additional buttons. This sets the mode for the pop-up dialogue windows for things like adding hyperlinks or editing the source HTML code. I prefer “modal” because it keeps everything in the same window, and users are mostly familiar with this type of interaction. These options determine which row the buttons appear on and in what order. It also groups buttons together until a separator ” | ” is used to split up the row. I came up with a specific order for the buttons that was similar to how MS Word groups buttons for formatting text. The fullscreen button will not work properly in MOSS 2007 by default because SharePoint lacks a DTD in the Master Page, so use it with caution! This sets the location of the text formatting buttons. Typically you’d want this at the top of the Rich Text field. This aligns the buttons in the toolbar. I chose to left-align them. This is one of the most important options. It determines, in combination with the mode option, which elements TinyMCE will be applied to. I decided to select elements with a class of “tinymce-enhanced.” In order for this to work, I’ll need to add this class to the <textarea> elements on the forms. This option specifies a .css file to use on the content of the Rich Text field. When used with a .css file that matches the branding of your SharePoint site, it provides content authors with a pseudo-preview of what their content will look like because it will use the branded fonts, colors, and sizes from the .css file. By default, TinyMCE uses relative URLs for emoticons; if they are not stored in the same folder as the page that will display content from TinyMCE, the relative path will be wrong. I set this option to false so it uses absolute URLs. The absolute URL will still be relative to the site collection (the actual src attribute of the <img /> element will look like this: “/Scripts/tiny_mce/plugins/emotions/img/smiley-smile.gif“). Once you determine which options you want to use, add the TinyMCE initialization function to the <script> block you created. 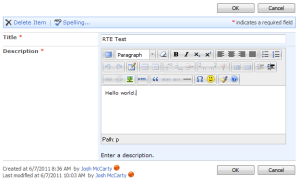 This is the function that SharePoint executes to create the default RTE. By adding this function to the page and leaving it empty, we’ve effectively stopped the default RTE from loading. Unfortunately there is still some work to do. SharePoint doesn’t just render a <textarea> when the page is loaded in Internet Explorer, even when we override the RTE function. It also renders a hidden <input> below the <textarea>. These are further nested in two <span> elements, which complicates things a little bit. 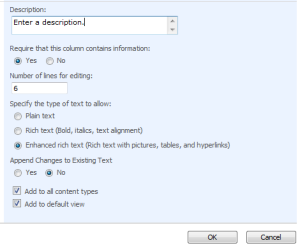 SharePoint renders several elements for an Enhanced rich text column. Duplicate validation messages appear on the page (I’m guessing this has something to do with the fact that there are two elements for the column—the <textarea> and the hidden <input>. SharePoint wraps the contents of any “Multiple lines of text” column in a <div> with a class that starts with “ExternalClass” when the form is submitted. If the item is edited, SharePoint will helpfully re-wrap the contents in another <div> without the default RTE function. After a few edits, you can see how this would get a little ridiculous. Because we replaced the default RTE function with a blank function, we need to handle these interactions in our script. We should also remove the “Click here for help about adding HTML formatting” link that SharePoint displays in non-IE browsers for consistency across all browsers. Overriding the default RTE function results in duplicate validation messages. We can handle this with some DOM manipulation. First we’ll move the <textarea>, hidden <input>, and the first validation message out of the <span> containers, unwrapping any existing contents in the <textarea> so they aren’t wrapped in multiple <div>s. Next we’ll remove the <span> that used to contain them and all the other junk that we don’t need anymore. Finally, we will add the appropriate class name to the <textarea> so TinyMCE can find it (remember to use the class name set in the TinyMCE initialization options). To use TinyMCE on multiple columns, simply add another line inside the ready function that calls TinyMCEPrep(); with the name of each column you want to use it on. Now that the DOM is ready, the last step is to call our TinyMCE initialization function. This should be done within the ready function above, but after the TinyMCEPrep(); functions. As you can see, this is not a trivial amount of DOM manipulation, so be aware of the potential for performance issues on slower clients. In my test environment, it worked fine in IE8, Firefox, and Chrome. IE8 took about 1 second to process all of the script and render TinyMCE; the other browsers were much faster (as expected). This probably wouldn’t be a good solution for a complex form with lots of rich text fields, but for smaller forms it works just fine. If you decide to create a custom form using a Data Form Web Part instead of using the default form, you can convert the SharePoint field into an ASP <textarea>, give it the appropriate class name for TinyMCE to find it, and call the TinyMCE initialization function without needing the DOM manipulation function at all. This results in a much leaner and faster implementation of TinyMCE. Please let me know if you use this script and how well it works for you. I’m interested to see what kinds of performance issues, if any, other people have using it. There may be better approaches to the DOM manipulation function that are faster than my solution, so if you come up with anything that seems to work better, I’d love to hear about it! I am having problems getting this work in SharePoint 2010. Have you tried to use this code in SP2010? Can you think of any pitfalls? I’ve only done this on 2007. I doubt it will work in 2010 due to the new ribbon controls. Can you recommend any way to use TinyMCE work in SharePoint 2010? Can you think of any solution which would replace the default rich text editor in SharePoint 2010 with a more advanced one? Please, answer at jiri@jiripik.com. thanks. Where can i find tinymce-enhanced.css file. Its not available in the downloaded files/folders. That is a file that I created myself so the text that is typed into the TinyMCE editor looks like the actual SharePoint site. It’s not required to make TinyMCE work, but for your end-users it’s a nice addition so they can see what the final output will look like. Check out http://www.tinymce.com/wiki.php/Configuration:content_css for more information. Will the Tiny MCE editor work on SharePoint 2007 content pages too ? Have you used it for regular content pages with the rich text editors ? I have an issue with the regular RTE in a content page and was hoping to see if I could use Tiny MCE instead. I have not tried to use it on SharePoint content pages. I looked into it, but never got far figuring out how to override the default Rich Text controls, and it hasn’t been a requirement for any project I’ve worked on. Thank you very much for your response. I guess I will have to find a different way then to figure out how to address the problem with the messy RTE control within SP 2007.